California Dreams Hostel is located just 30 seconds walk from the beautiful Pacific Ocean. 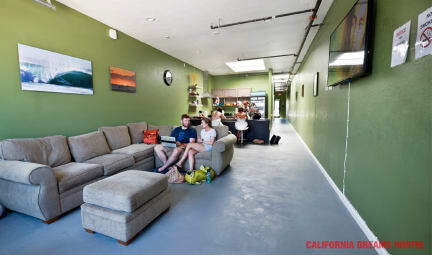 When we created California Dreams Hostel, we wanted to create a true hostel experience for travelers all over the world. We provide the fun, community atmosphere of a hostel, while having all of the amenities, cleanliness, and comfort of staying at a Hotel. We are located in the heart of Pacific Beach, the perfect neighborhood to spend your entire stay or branch out to see all that San Diego offers. You’ll experience true California hospitality as you explore all of the restaurants, bars, nightlife and beach activities within walking distance. Explore neighboring areas by hopping on a scooter, taking a Lyft/Uber or use our transfer service. Another option if you’re watching your budget, is the bus line which has a stop one block away. Start your day off with our complimentary breakfast burritos, then check out our many activities including daily surf/sup lessons and daily tours. Rent a surfboard and take to the waves, or rent a bike and stroll across Pacific Beach in style. Take a break and relax in our comfy common areas while you meet and socialize with travelers from across the world – watch a movie or plan your next adventure with your new friends! Changes to booking(s) cannot be guaranteed and are subject to availability. Check in from 14:00 to 00:00. Please contact the hostel if you are arriving after midnight. After booking with Hostelworld, this property will charge the credit card on file a first-night deposit that will be deducted from the total amount at check-in. Taxes not included - 10.50% occupancy tax will be added. Free Breakfast which is a baby burrito(eggs, cheese, and sausage) plus a cup of coffee or juice. There’s an age requirement, guests must be at least eighteen years old to stay. You must have a passport to stay at the California Dreams hostel. You must also be able to show proof of on-going travel. A maximum stay of 21 nights applies at this hostel. The hostel is a smoke-free zone. Regretfully pets are not permitted in the hostel. Use of Personal information: All guests staying with us release liability for the use of photos that they are pictured in. The Hostel randomly takes photos of just having a great time and uses these photos for social media and marketing purposes. If you do not want to be included in the fun photos. Please let the camera man know. Liability: California Dreams Hostel does not assume liability for any theft, damages or injuries occurred while staying at our property. 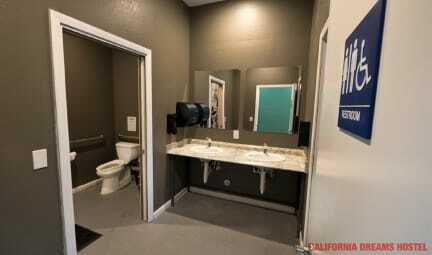 California Dreams Hostel is a private business and is allowed by law to refuse service to any customer or patron. My stay was fantastic, would recommend to this place to the older travellers late 20’s as it wasn’t a party hostel vibe. Is more of a chilled atmosphere. The staff couldn’t have been more helpful. The location was perfect for all things food, drink and surfing. 10 out of 10 only wish I could have stayed longer. Great time overall. Staff is super welcoming, everything was super clean. Definitely one of the smaller hostels in San Diego, but it made for a cozy feel. For the price, best value in the area. And smack dab on the beach. My stay was all good. Staff was good and attentive as necessary. Bus connection close by, and lots of entertainment and food nearby. Great!! Incredible location - practically on the beach (PB). The hostel has pretty reasonable beach rental gear that I used a couple times ($8/day for a chair and umbrella). Everyone on staff was easy to talk to and friendly. The place was clean and in great shape. I liked the privacy curtain for my bunk bed. There were lockers in the room as well. Only three bathrooms in the hostel but I never had to wait too long. Free breakfast from a restaurant next door was small but tasty. Had a great time! Super good location and friendly staff! And the bed was reeeally comfy! Would recommended stating here for sure! The location can’t be beat! The hostel is located in the perfect location. The facilities were excellent and the environment was friendly. Pedro is one of the coolest people I’ve met and the fact that he’s from Brazil added to his swagger. He greeted me and every other guest with a warm smile and friendly vibe. He was super helpful with suggestion on what to do in the local area. This hostel is excellent. Make sure to sign up for one of their many tours and activities. Cheers!!! Fantastic service... very small and clean hostel. Private room was very small not much space but beds were comfortable and all facilities were very good. Staff were very personable and friendly. 10-person room exceeded my expectations. I loved the curtains, clothing hooks, little light and electrical outlets at each bed. Lockers for valuables available in room but not big enough for suitcases. The pillow was nice. Ensuite bathroom was spacious and clean. Staff here were friendly. I did catch the room door being kept open a lot by staff, which is not the safest as it opens to the alleyway. Anyone can walk in and grab suitcases! I was so paranoid. Cute place with great location very close to the beach! The staff was super nice. They have a lot of activities, but it is still a small place not so many people, make it intimate. Check out the free breakfast its nice!